Underfloor heating (UFH) is the perfect partner for most kinds of heat source, including condensing boilers and renewable technologies such as heat pumps. By enabling the lowest flow temperatures to be achieved, UFH helps to maximise efficiency and improves heating bills. It is an extremely flexible product and can be installed in a wide variety of building types including new build (domestic and commercial), renovations and increasingly in retrofit, through the use of low profile floor constructions. UFH is being successfully used in a diverse range of properties, from family homes, barn conversions and apartments to offices, hospitals and even castles. 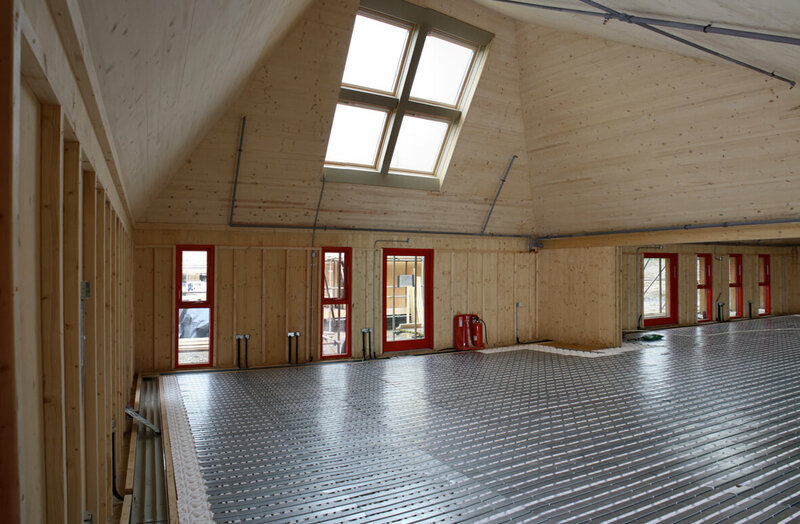 UFH works well with screed floors, floating floors and suspended floors, each meeting different requirements with regard to specification and installation. Screed is the simplest floor construction and often gives the best performance as screed is such a good heat conductor. The output from a suspended floor is lower than screed but good system design will ensure that output requirements are easily met. Floating floors have a higher heat output than suspended floors although still not as high as screed; however, installation time is quicker as there is no drying time to be factored in, making this a popular and effective option. The potential of UFH to support low temperature heating systems in older properties has frequently been dismissed due to questions surrounding floor height build up, response times and insulation, but recent developments in floor constructions suitable for retrofit now make UFH a feasible option. 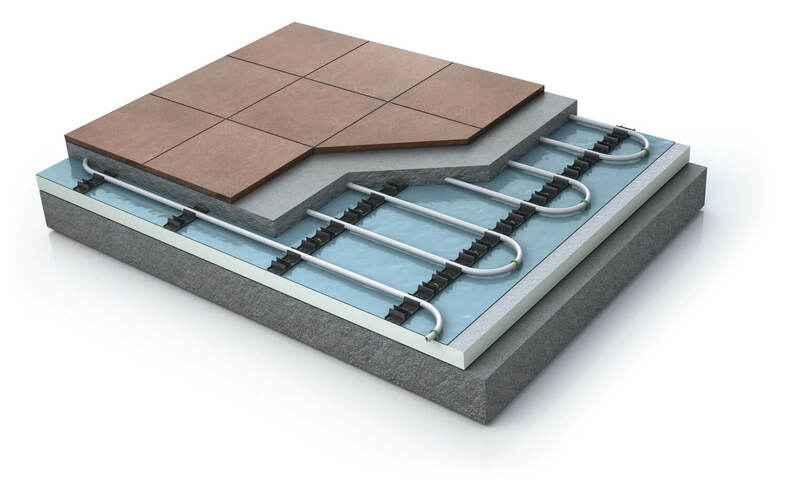 For example, Nu-Heat’s low profile UFH floor construction LoPro10® has a height build-up of just 15mm and can be laid over the existing deck, so there is no requirement to pull the existing floor up. With one-third less thermal mass than a screed floor, LoPro10® heats up rapidly, which is an obvious advantage in older properties. To get the best performance insulation levels will need to be increased through improvements such as double-glazing, loft and cavity wall insulation, meaning that Georgian and Victorian properties with little or no insulation are generally unsuitable for UFH due to the poor levels of air tightness. A design and supply company such as Nu-Heat will advise on the suitability of underfloor heating on an individual basis as well as provide projected performance details and a bespoke design for each system. System design is key to good performance so it’s important to establish the most suitable floor construction and flow rates for a property. Nu-Heat takes elements such as existing insulation and heat loss parameters into account to ensure that not only the desired amount of heat is provided but that the system is also economical and efficient. For many domestic installers, the light commercial market presents opportunities for UFH installation. Care homes, social housing, holiday complexes, schools, showrooms and warehouses are all potential applications for UFH. The system is relatively straightforward to install, as long as it has been well designed and is supported by clear, comprehensive installation documentation. Nu-Heat usually supplies 14mm pipe for domestic properties, whereas commercial projects use a 20mm pipe system that is flexible and easily worked into spaces greater than 45sqm. For acoustic floor constructions that meet Part E, Nu-Heat has over a dozen commercial Robust Detail (RD) options and has recently developed AKA 14, which, although it is not RD, has been tested and proven to meet required acoustic levels whilst removing the need for a second layer. Underfloor heating and heat pumps are widely recognized as perfect partners as they are both suited to the low temperatures needed to maximize system efficiency – the higher the flow temperature that the heat pump is asked to produce the less efficient it becomes. As a result, UFH, which typically operates at a low temperature of 40-45 oC, allows the heat pump to operate at optimum efficiency and ultimately minimize fuel costs for the homeowner. Further reductions in flow temperatures to around 30oC – 40oC can be achieved by using additional tubing and more efficient floor constructions. For properties that remain reliant on fossil fuels, the best option is for the homeowner to upgrade their boiler to a condensing boiler. Where a conventional boiler is 85% efficient, a condensing boiler can be up to 92% efficient. The condensing boiler actually needs less fuel to raise the temperature of the heating water by the same amount. This means that UFH will offer better energy efficiency than a radiator system which cannot make the most of a condensing boiler’s capabilities at typical system temperatures. Code 6 is getting closer, with just three more years until it becomes mandatory. In the run up to 2016, flow temperatures will become increasingly lower – and effective heating may well be achieved at just 35°C. As the business of heating houses changes, UFH continues to offer a way to reach lower temperatures, and remains an ideal solution for many applications.